One of the two Original Yurts, this 315 sq. 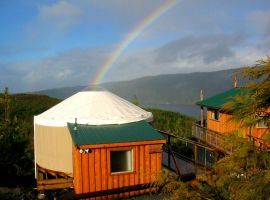 ft. Yurt has beautiful views of the San Juan Bay and is tastefully decorated with mission style furniture. Inside is a Queen bed and Double Murphy bed, a leather sofa and coffee table. Amenities also include a microwave and luggage rack. 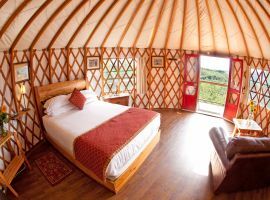 Yurts are not suitable for children under 5 years old. Comfortably sleeps 2 to 4 people. 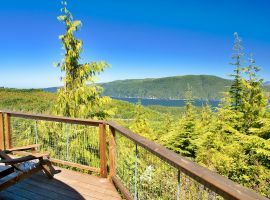 Rates - $155 to $205 with Full Hot Breakfast. Click BOOK ONLINE for rates on specific dates.